It’s the last weekend of the year, the last day of the year. I decided to usher 2017 out the door by making soap. I haven’t been making as much soap this year as I did in 2016 but I am still reading about soap and planning soap. Yesterday, I made an experimental batch of soap that uses two kinds of lye, sodium hydroxide and potassium hydroxide. 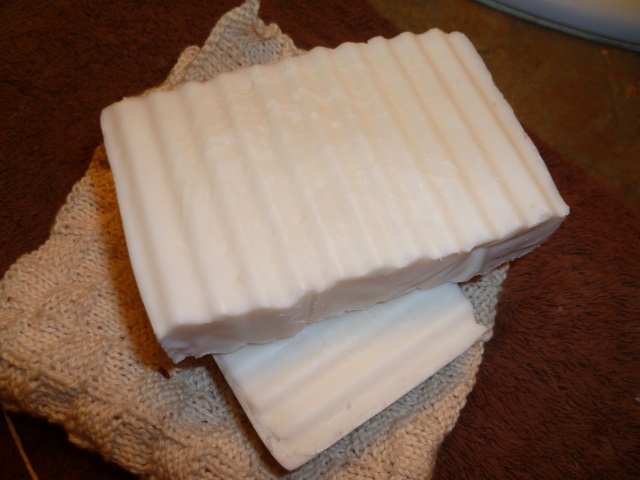 In my reading, over at the Soapmaking Forum, I came across a post about a dual lye soap and how using both can increase the lather in a low coconut oil soap. I decided to give it a try. It is now out of the mold but still quite soft and not ready for slicing yet. I coloured this one with Aztec Gold mica and it’s scented with a combination of cedarwood, rosemary, and lemongrass. It smells wonderful! Now, I am in the mood to make another batch of soap for the upcoming year. I’ll be making a batch of Lavender & Goat Milk soap, a lovely mild, skin-loving soap that smells amazing. It will help to use up some of the goat milk languishing in the freezer. And we’ll be set for the upcoming year. And, just because, here are a few pictures taken over the last few days. It’s definitely winter here. It really is a knitting kind of day. Winter has decided to come early to our area. 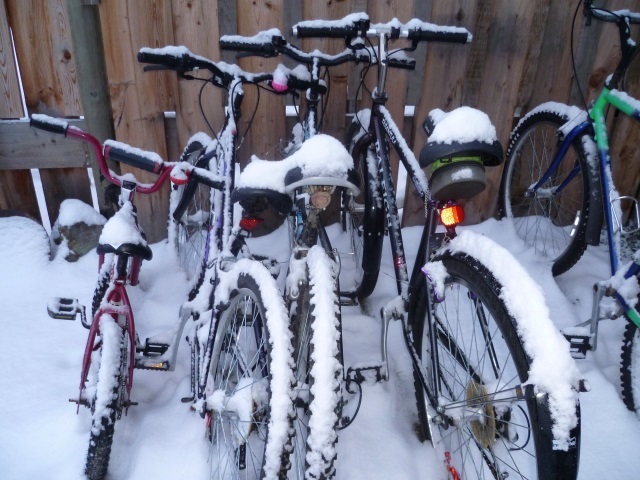 This week, we received a few inches of the white stuff. Pretty but, in the words of a much younger Ethan, I no like it. Night time temperatures have been hovering around -10ºC, with daytime temperatures around -1ºC. When the temperatures are like that, it’s good to get your hands into wool. John desperately needs a new pair of slippers… again. I’ve been making him slippers almost yearly for a few years now. As long as he likes them, I’ll keep making them. This year, we’re going with a heathery brown with burgundy trim. I bought the yarn, then asked his opinion. Thankfully, he likes the combo. The pattern I’m using, as usual, is the Fibretrends Felted Clog pattern by Bev Galeskas, AC-33. I had to purchase the pattern because I can’t find the one I originally bought. I’m sure it will turn up somewhere but, I must say, the new version of the pattern, printed on white rather than the turquoise they used to print on, is much easier to read and follow. The last pair I made… now in tatters. I’ve also decided that we should have some house slippers handy for when Kristen and the kids (and/or whoever else) come to visit. The floors here can be chilly and, obviously, we really don’t want people leaving wet, snowy boots on in the house. A basket of slippers near the door would be a good thing. I do have a few pairs here but they’re old and they’re wearing out. I set out to find a pattern. I didn’t want anything difficult; no felting because those are made to fit specific feet; as little sewing as possible; something appealing because no one wants to wear ugly slippers. I mean, seriously, would you wear ugly slippers? 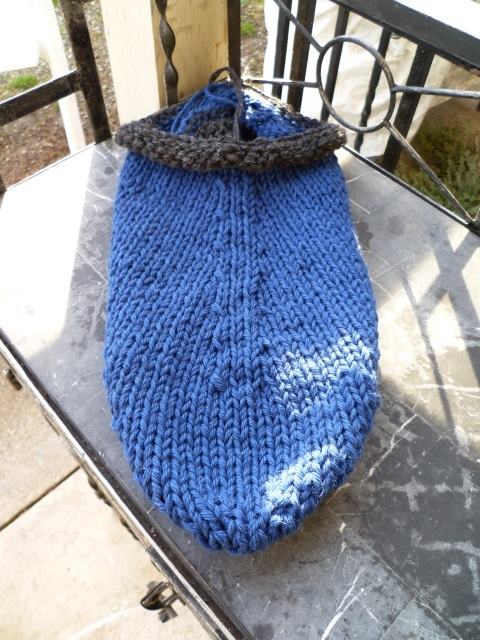 In my Ravelry search, I came across a few patterns based on a Russian/Bosnian slipper. I downloaded three versions of the pattern and drove across town to Michaels to buy some inexpensive acrylic yarn (I want to be able to throw these slippers into the washing machine as needed without worrying about shrinkage). I came home with three skeins, one variegated and two solid colours, navy blue and dark green. 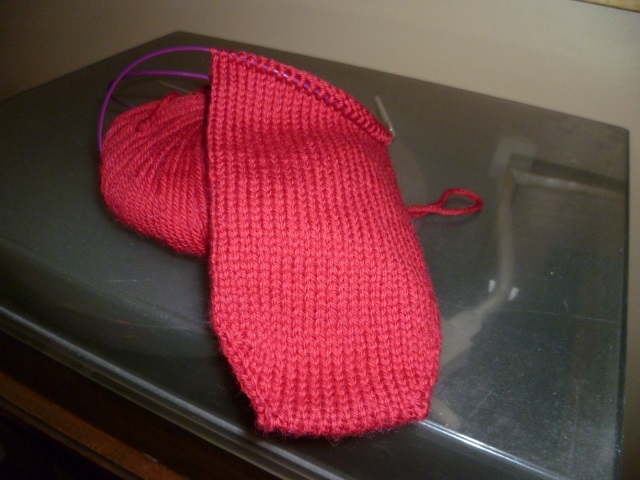 Then, last night, while John was napping, I cast on for the first slipper, in the small size for testing purposes. By the time bedtime came around, I had one slipper finished. I’m impressed with the pattern. The whole slipper is knit in one piece on straight needles, although I did switch to a circular about half way through because the increase area at the top of the foot creates a 90º angle that bunches up a bit on straight needles. There’s no sewing up at all, only weaving in a few ends. And they’re cute. I’d wear these if my feet were cold (I like my Crocs with woolen socks) and someone offered me a pair to warm my toes. 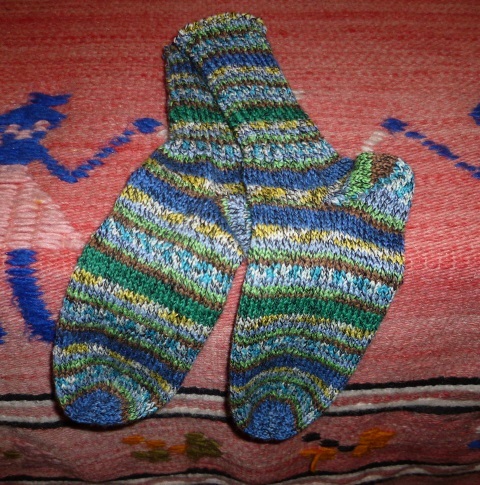 The pattern I used is Slip Stitch Slippers by Nailya Plaskey. It’s well written, easy to follow, and turned out very well. The only small change I made was in the heel area. The sole is worked on 11 stitches from the toe to the heel; for the heel area, I decreased gradually from 11 stitches to 7 stitches, only because ankles are narrower than heels and I think it may help the slippers hug better. We’ll see. Now, breakfast and tidying up. Then…… Knit on! The middle of February… already! 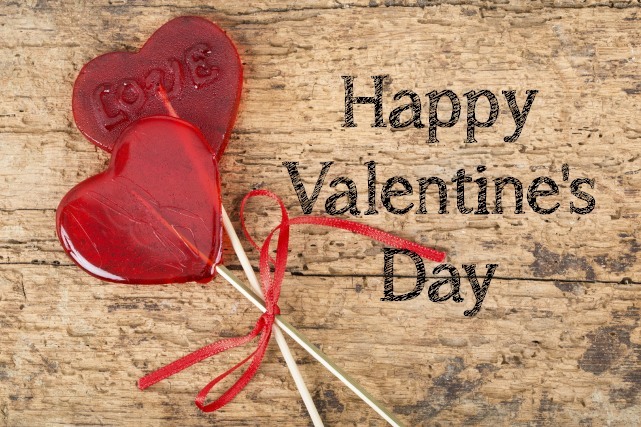 And, yes, today is Valentine’s Day. It’s pretty gorgeous here today. Right now, the sun is shining and it’s about 9ºC (48ºF). It’s definitely a day to get out there, something I intend to do shortly. I did wander about a bit this morning, checking on the garden out front. I wasn’t surprised to see bits of green showing. This is a stand of poppies, the nice big, bright red ones. 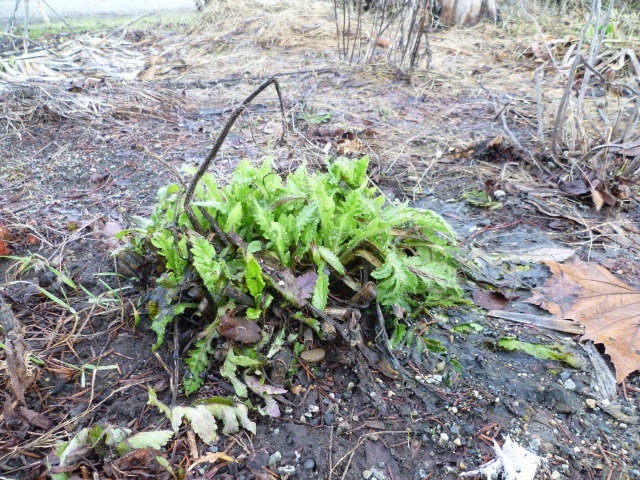 I was surprised to see it, and the other stand, as green as they are; I think they may be the first to flower this year if they keep growing like this! 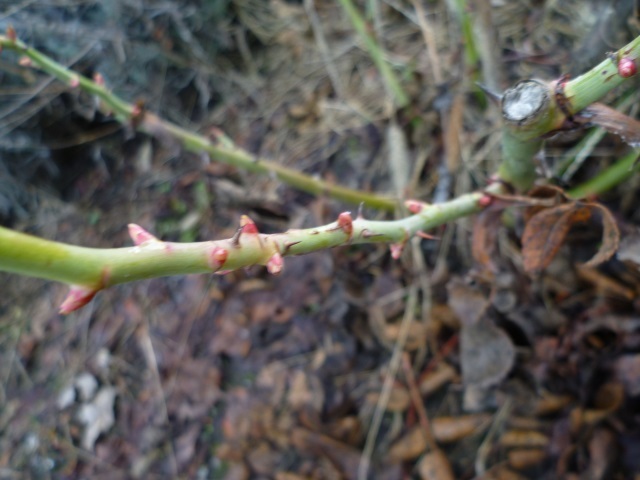 Even the roses are starting to put out buds; I noticed the irises and daisies are starting to come up, too. I did tell John that I’d wait until the beginning of March before getting into clean up mode but we may have to start sooner if this weather keeps up. 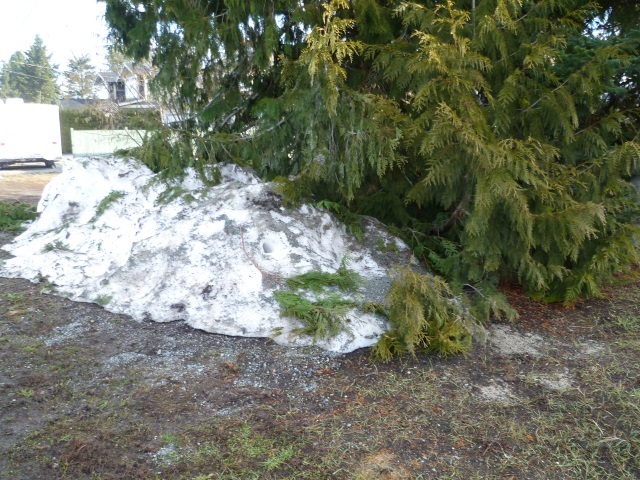 This is all that remains of our January snowfall. At one point, the kids had tunnels in this pile; it really was a big pile, higher than the kids were tall. They were even sledding down one side of it. Now, though, spring is on its way and I, for one, am more than ready for it. We’re coming in to my favourite time of year. This past week did see some progress on the knitting front. That’s the first of John’s pair of slippers. I always chuckle as the size of these slippers before the felting process; they’re huge! I still have the second sole to complete but the knitting, at least, is done on this slipper. The second sole has been cast on. It doesn’t take long to knit the sole but it does demand some concentration; if you’ve ever knit this pattern, you’ll know what I mean. 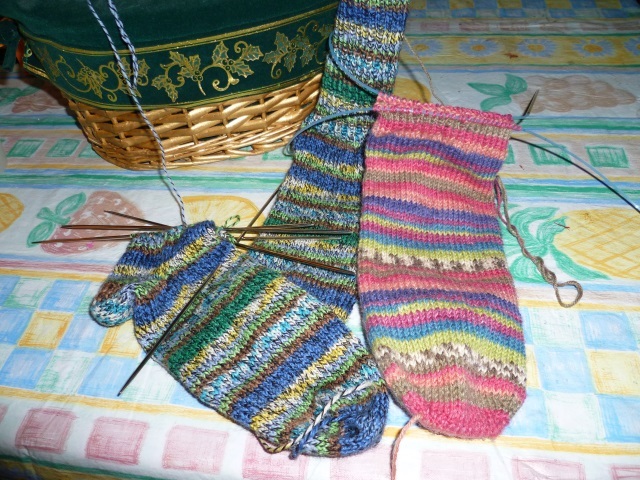 I’ll try to get this pair done this weeked but I have every intention of enjoying this mild weather while we have it. In the meantime, I wish you all……. And suddenly, it’s December! We’ve had snow, we’ve had freezing rain. We’ve had cold temperatures (down to about -15ºC); it’s warming up a bit now (at about 3ºC right now). Both John and I have been hit with our first colds of the season; mine kept me home for two days. We’re on the mend now, thankfully. With winter weather comes the urge for knitting. I’ve really been bitten by the knitting bug this winter, more than I have all year. I suppose the break from knitting was a necessary one. Coming back to it now, I’m finding myself enjoying it more than I have in what feels like a very long time. This past week, I’ve kept my needles busy. 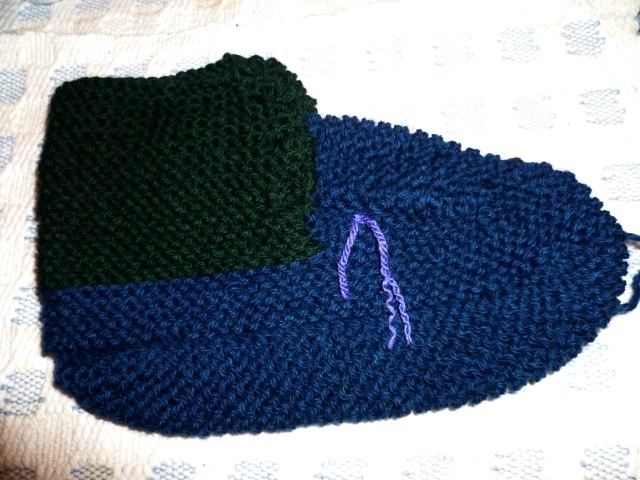 One of Ethan’s slippers is finished… well, the knitting of one slipper is finished. The second is almost half finished. They won’t be completely finished, of course, until the felting process is complete. The little piece of purple yarn is there as a marker for joining the cuff to the foot. Once felted, these slippers will look like high top running shoes, complete with laces. Once Ethan’s are finished, I’ll make Trinity’s and won’t felt them until the kids are around to watch the process. I also started, and finished a small project for a friend with a baby. Over the years, I’ve come to realize that scarves on little ones can be a hazard and the use of scarves is no longer encouraged for infants. 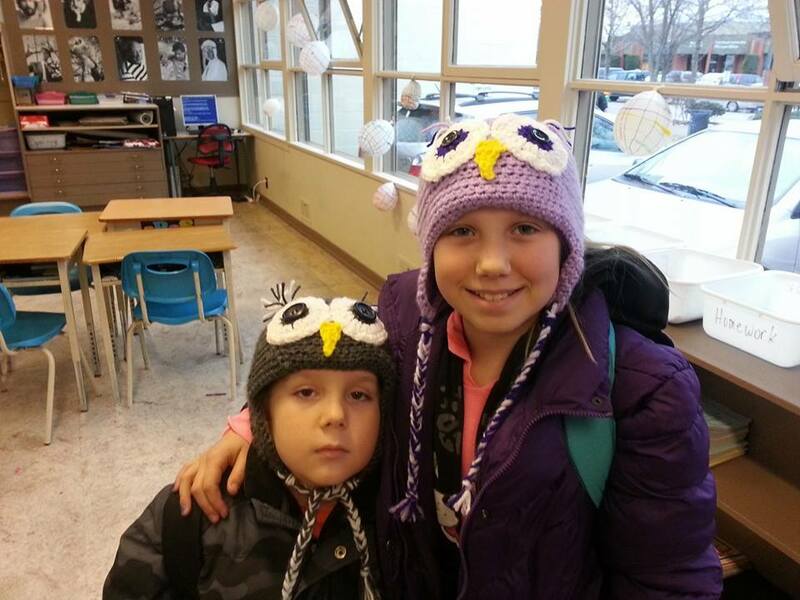 When the weather’s cold, though, little necks need to stay warm, too. I’ve always been of the belief that if it’s cold enough for you, as a parent, to pull on a sweater or wear a jacket, hat, scarf, and mittens, you should be dressing your child accordingly as well. To that end, I went hunting on the Drops (Garnstudio) web site and found a cute little pattern for a neck scarf that ties at the back. The pattern is Henrik VIII (click the title to see the pattern). It uses less than one ball of yarn and would have been finished in one evening if my cold-clouded brain had comprehended the increase row near the end. If you check out the pattern pictures, you’ll see that it covers the neck nicely and looks almost like a dickey. It should definitely keep any cold winds or gusts off of the recipient’s neck. The yarn I used was some leftover Sandnes Garn Lanett Baby Ull, 100% superwash wool on 2.25 mm straight needles. I also decided this week that I’m going to knit another pair of socks for myself… maybe. I’m not sure I have any more of the yarn I started with so this may end up just being an experiment that will be frogged once I see how it fits after turning the heel. We shall see. For now, it’s simply mindless knitting. I’ve been toying with a few ideas. I may knit this one up to the heel, work the heel in a different colour, then work the cuff in a third colour. Hopefully, working it like that might leave me with enough yarn to work the foot of the second sock in the same way. I only have one 50 gm. ball of the red yarn, unfortunately. I bought it quite some time ago so I doubt I’ll be able to find another ball of it; even if I did, I don’t remember what brand it is as there’s no tag or label with it. I do know that it’s a superwash DK wool and is very soft and cushy. If I do manage to make a matching sock, they will definitely be nice and warm. I like nice and warm! Before I end this post, I have to do a bit of bragging. It’s not bragging about myself; I have to brag about my daughter. She’s been crocheting for some time now but has never quite picked up on how to read a pattern; well, she sure can now! Ethan doesn’t look very happy, does he? He wasn’t feeling well when Kristen picked the kids up from school and, shortly after this picture was taken, he threw up. He does love his hat… really! Kristen has been keeping her crochet hooks flying and I have convinced her to join Ravelry. Once she saw how easy it is to look up all kinds of crochet patterns, she was hooked (yes, bad pun, I know… couldn’t resist). There’s more I could write about but this post is, I think, long enough. I’ll save the rest for another post. For now, I’d best get going. I made a big pot of pea soup last night and I’m planning on baking a couple kinds of bread today – Raisin bread and another couple loaves of white bread for the freezer. As well, there’s laundry to do and Christmas decorating to be put up, and…… well, you get the picture. I am pleased to report that Ethan’s socks are off the needles, finished, ready to be slipped on to (not so) little feet. I’m feeling very productive and rather pleased with myself, to be honest. Not only are they finished, they even match! I don’t normally go out of my way to make socks match when I’m using self-striping yarn but I thought that, in this case, I’d see how closely I could get them to match. They’re pretty much identical, right up to the cast off edge of the cuff (one half yellow, one half blue). Trinity’s socks are coming along nicely, too. This was taken yesterday morning, before I’d finished Ethan’s socks. Trinity’s are further along now as well; I’m about halfway up the cuff. My goal is to have the first sock finished today and cast on for the second one by tonight. If I can get the toe done, it’s mindless knitting up to the heel. I have to say, I’m pleased with this pattern/method. To call it a pattern is something of a misnomer. It’s really just a collection of its parts; I used the directions for the round toe, the directions for the Fish Lips Kiss heel, and then the directions for Jeny’s Surprisingly Stretchy Bind Off. I will put links to all three on the “On The Web” page ( Jeny’s SSBO is already there). We had our first snowfall of the year this weekend. It wasn’t much but it sure was fun to be able to reveal to Trinity and Ethan the first snow they’ve encountered here in Kelowna. They were watching a movie when I opened the door and showed them that there was snow on the ground. After we finished dinner, they went out to play in the wet, slushy snow and even tried to make a snowman. 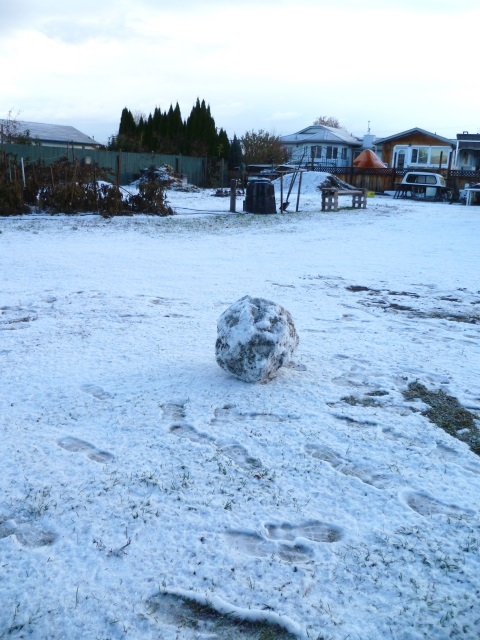 By Saturday, it had frozen over and the kids spent a lot of time “skating” (sliding) on the driveway and sledding down the pile of sand (at the back corner or the yard). I was amazed at how much time they spent out there. As for me? Snow on the ground means knitting time! It’s getting colder here. This past week, the temperatures have dipped down to a very chilly -12ºC (about 10ºF) with the daytime temperatures hovering around the freezing mark. Apparently, at the college, almost all the leaves are down, with a few stubborn holdouts (mainly the London Plane trees). There were even some swirling snowflakes yesterday; a sign of things to come? Winter is definitely here. With the cold comes the need for “warmies”; I’ve started perusing mitten patterns for the kids (nothing fancy as I’m sure more than one pair will go missing before winter is over – they usually do). They’ll be needing them for sure! I’ll likely stay with an old tried and true basic mitten pattern as they knit up quickly and the pattern is a familiar one. And the slippers need knitting up very soon. Sooner rather than later! In the interim, though, Ethan’s socks are coming along. I’m ready for binding off the first sock and the second has been cast on (that little bit of yarn on the needles perpendicular to the cuff. Don’t mind the table cloth; it isn’t dirty. The streaks are old paint stains; this is my crafting tablecloth. I’d rather have spills and stains on it than on my nice fabric tablecloths – I should get a new one, though. This one’s rather ugly. I digress. This is where the title of this post comes in. The finale would be the bind off. I’ll be using Jeny’s Surprisingly Stretchy Bind Off, which originally appeared in the Knitty Fall 2009 issue. There is also a You Tube video of the technique, by Cat Bordhi, for those who would prefer to see the bind off process in action. Now, all I need is a foot to try the sock on. 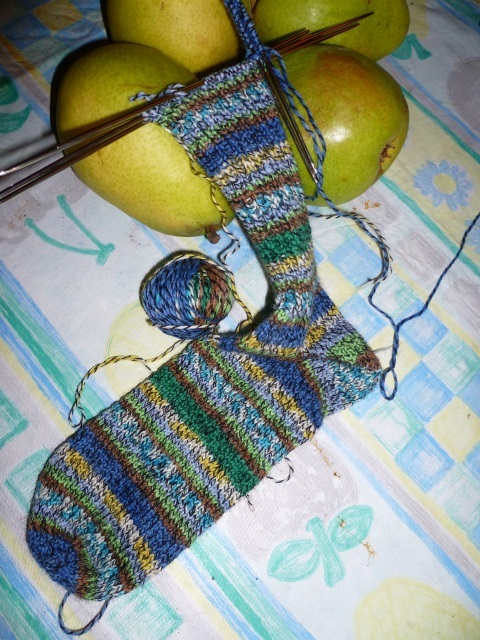 After that, it’s working towards the Grand Finale… a finished pair of socks! Edited to add: IT FIT!!! Perfectly! On to sock #2!